This entry was posted on April 20, 2013 at 5:53 am and is filed under Linguistics in the comics, Puns. You can follow any responses to this entry through the RSS 2.0 feed. You can leave a response, or trackback from your own site. The K2 has nothing to do with the content of the strip. It’s one of 10 secret symbols hidden by Don Piraro in his strips (explained on the website for the strip). The number of hidden symbols is given in the strip, by Piraro’s signature. For this strip, the number is 3: K2, the eyeball on the man’s shirt, and the firecracker on the right curtain. 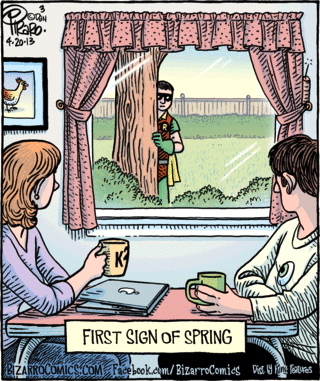 I’m not sure you need to know about the first robin as a sign of spring; I didn’t but I inferred it from the Gricean maxim of relevance. But the cartoon would probably have been funnier if I had known, so maybe it didn’t “work” for me, even though I “got” it. Like mollymooly, I inferred it but it didn’t really work for me as I associate [European] robins with winter. Incidentally, in Italian swallows [rondini] are a sign of spring [primavera], and one swallow doesn’t make a spring, rather than a summer (una rondine non fa primavera).